You are inquisitive. You collect things. You might collect information -- words, facts, books, and quotations -- or you might collect tangible objects such as butterflies, baseball cards, porcelain dolls, or sepia photographs. Whatever you collect, you collect it because it interests you. And yours is the kind of mind that finds so many things interesting. The world is exciting precisely because of its infinite variety and complexity. If you read a great deal, it is not necessarily to refine your theories but, rather, to add more information to your archives. If you like to travel, it is because each new location offers novel artifacts and facts. These can be acquired and then stored away. Why are they worth storing? At the time of storing it is often hard to say exactly when or why you might need them, but who knows when they might become useful? With all those possible uses in mind, you really don't feel comfortable throwing anything away. So you keep acquiring and compiling and filing stuff away. It's interesting. It keeps your mind fresh. And perhaps one day some of it will prove valuable. Enjoy reading the dictionary and the encyclopedia -- this might seem strange to some people, but for someone like you it is a good way to strengthen your self-concept. 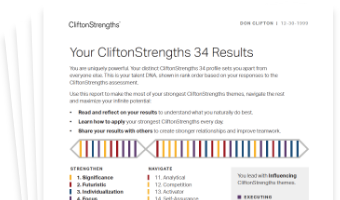 See how Input shows in your CliftonStrengths results -- discover All 34 CliftonStrengths Themes today!